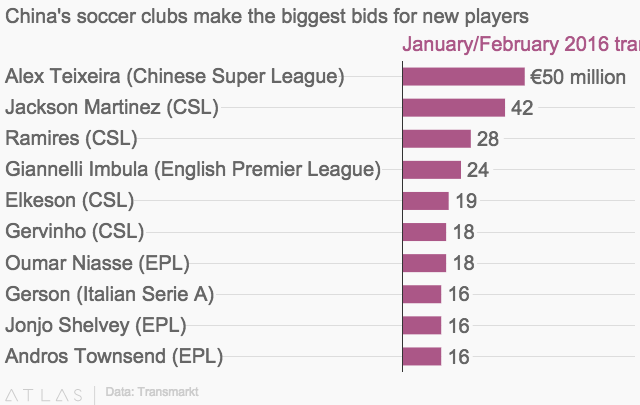 Professional soccer has become the latest target of China’s “explosive shopping sprees.” Chinese Super League clubs spent €337 million ($366 million) in the most recent January-February “transfer window,” outstripping the world’s other soccer leagues. The record-beating fees, paid for player transfers during the two month session that ended on midnight of Feb.26, are four times more than China’s previous record, and nearly $100 million more than the English Premier League’s €253 million blowout. They are also more than the other four major European leagues (Italy, Germany, France, and Spain) spent combined, according to Transmarkt. Some of the world’s top soccer players have headed to China amid the gold rush, including former Atletico Madrid striker Jackson Martinez and former Chelsea midfielder Ramires. In one €50 million deal, China’s Jiangsu Suning beat Liverpool in the bidding for Brazilian striker Alex Teixeira. The 26-year-old was the most expensive of the winter transfers, but four other CSL players made the top 10. To put it bluntly, money is only reason China has suddenly become appealing to big-name players. Far from first-class, the Chinese Super League needs to spend more on transfer fees and salaries to lure stars. A top player who leaves Europe’s major soccer leagues for China will face far less competition on the pitch, which is bad for his career. Teixeira earns a reported €10-million annual salary in his four-year contact with Jiangsu—a huge salary for a player who has never made it to the national team in any major European championships. China’s property tycoons own most of China’s soccer clubs, and their deep pockets are rarely because of the love of soccer. Instead, the spending spree can be traced to top leader Xi Jinping’s publicized obsession with the sport. 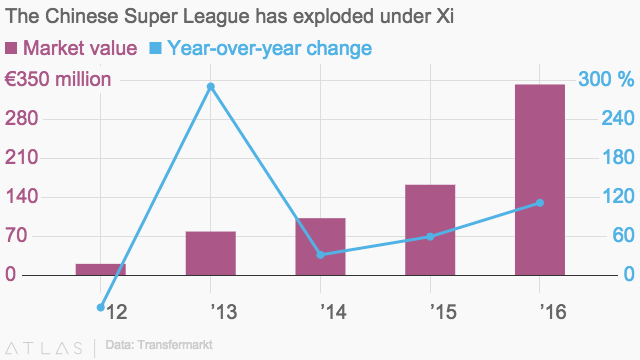 Xi’s love of soccer may have also spurred Chinese investors to bet on foreign teams. During his October visit to the UK, Xi famously took a selfie with Argentina striker Sergio Aguero and British prime minister David Cameron during a tour of Manchester City’s stadium. 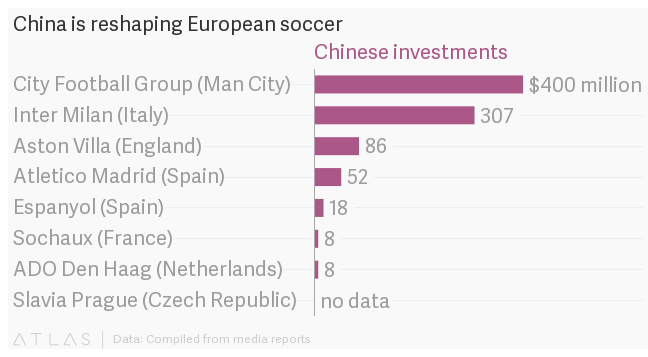 Two months later, two state-backed Chinese companies bought 13% of the shares of City’s parent company, the latest example in a series of China’s overseas soccer investments.